Detailed review of It Cosmetics Secret Sauce. 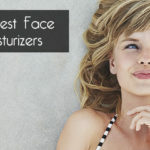 See what real experts and actual users have to say about this moisturizer. # of Ingredients: Over 100! After trying It Cosmetics Secret Sauce, I ranked it 2 out of 5 stars because I don’t think it’s as good as your average moisturizer. I did see some positive results from using it, it’s just way to heavy and oily to use everyday on my skin. I liked the results better when I’d use it 1-2 times per week instead of twice daily. When I was using it daily it broke my chin out and caused really oily skin. I couldn’t even wear it under my makeup because it made my makeup look so greasy. This is definitely a heavier moisturizer. As far as the positive results go, my skin did look more even and youthful, which was nice. The ingredients are another aspect of this cream that I’m unsure of. It literally has so many ingredients…over 100! And the ingredients include a lot of oils such as vegetable, olive and castor oil, which explains why I got acne. It does have some good, anti-aging ingredients in it as well. The cream itself isn’t cheap; it’s $68 a pop. And in my opinion, that’s too expensive for this one. The good news is they have a 30 day money back guarantee, so you can always return the product if you aren’t satisfied. This moisturizer is stark white in color and has a creamy, whipped texture. It resembles a cloud. It’s soft feeling, but I wouldn’t consider this a lightweight cream. It Cosmetics Secret Sauce is very easy to apply. It goes on clear, with no white cast. It’s easy to blend in; I was able to cover my whole face and neck in about 30 seconds. The directions say to apply both morning and night. I had really great results when applying it at night, but not so much during the day. I found it left my skin a little greasy looking after a few hours, which I didn’t like. That in turn affected how my makeup looked. But I found using it once a day (at night) was more than enough for my skin. After I apply to my skin, this moisturizer takes a few minutes to dry, around 5 minutes to be exact. So that’s a good drying time if you’re going to apply at nighttime. It’s not like I was sitting around waiting forever for it to dry. 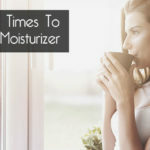 However, the drying time isn’t ideal when applying during the day under your makeup. It’s annoying having to wait 5 minutes to put on your makeup after applying your moisturizer. This lotion doesn’t have much of a smell at all, which is nice. It didn’t interfere with any other scents or products I put on my face. If I smell really closely I can smell a very light, fresh scent. When I use this It Cosmetics Secret Sauce at night, I wake up with my skin feeling so soft the next morning. Not to mention, my skin tone looks more even. When I use this lotion during the day, I’m not as impressed with the short-term results. After a few hours of wearing it, it made my skin greasy which cause my makeup to run. But I really like using it nightly, and the results from doing so were decent. One drawback is it gave me some little whiteheads on my chin which took a few days to clear up. After using Secret Sauce for a while, I was really pleased with how my skin looked. It felt and looked more plump, especially around my eyes and upper cheeks. My skin felt more hydrated, and I think this cream did well in the anti aging department as well. Sometimes it can be hard to tell when your wrinkles and fine lines are softening, because no moisturizer will work as well or as quickly as Botox or something stronger. But after time I did notice that my fine lines were less noticeable and my skin had a youthful glow to it. The downside to this moisturizer is it continued to break me out. This is the type of moisturizer I can only use 1-2 times per week because it’s so heavy. It’s just not a good fit for oily or acne prone skin. It Cosmetics Secret Sauce is paraben free, cruelty free, and hypoallergenic, all which are very important to me. I love that they’re cruelty free, nowadays there’s absolutely no need to test on animals, so I love companies that realize that as well. Now, not all the ingredients in here are necessarily good. This moisturizer has over 100 ingredients in it, which is just crazy! 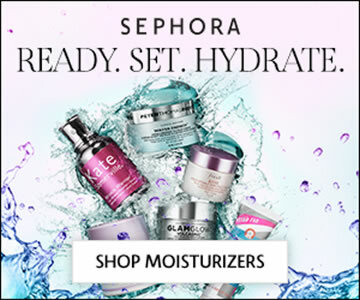 I’ve never seen a moisturizer with so many components. I don’t necessarily like that it has so many ingredients, and most of them I don’t even know what they are. It has a lot of oils in it, such as vegetable oil, castor oil, and olive oil. Vegetable oil in my moisturizer? That’s very weird. With all the oils in this one, I’m surprised I didn’t break out like crazy. (I did experience a mild breakout.) And the oils explain why my skin became greasy a few hours after application. It does have a lot of good ingredients in it as well, including a lot of fruit and plant extracts such as Pumpkin Ferment Extract, Panax Ginseng Root Extract and many, many more. It Cosmetics Secret Sauce isn’t cheap! It’s $68.00 for 2 ounces, which is a pretty penny to spend. 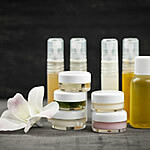 Yes, It Cosmetics offers a 30 day money back guarantee, which is very nice to see. 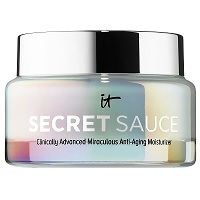 To buy It Cosmetics Secret Sauce, click here. Texture/Feel This is a heavy, white cream that resembles a cloud. Application Applying is easy and quick. Drying Time It dries in around 5 minutes. Long Term Results My skin looked younger and hydrated, but I continued to experience breakouts and oily skin. Guarantee Yes, they have a 30 day money back guarantee. Price It’s $34 per ounce, so expensive!